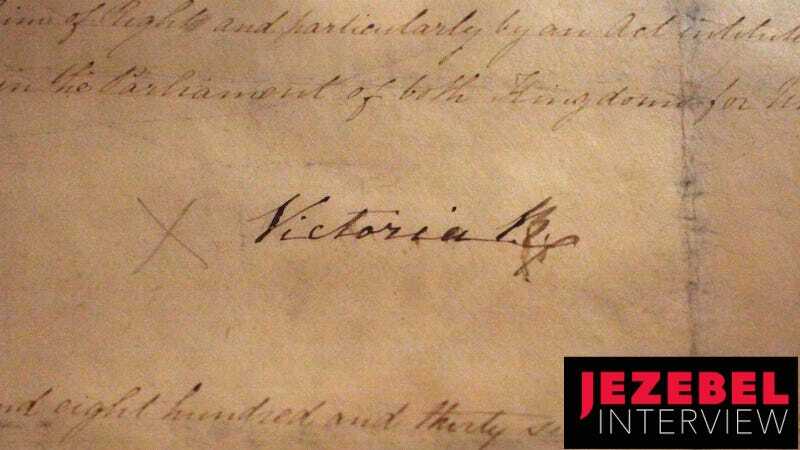 Victoria’s first signature as Queen. Photo: Getty. Prince Harry and Meghan Markle have swept the world into a media-friendly fairy tale, straight out of a made-for-TV rom com. But no matter how compelling a narrative and endearing the bride, weddings just aren’t as consequential as for prior generations of royals—for instance, Queen Victoria’s grandchildren, whose nuptials were planned with an eye to influencing the future of Europe. These marriages are the subject of Queen Victoria’s Matchmaking: The Royal Marriages That Shaped Europe, a well-timed new release by Deborah Cadbury. She looks at “the high summer of royalty,” the last era when a royal wedding was truly high-stakes for more than the couple, their immediate families, and content-hungry media entities. The book’s first chapter opens in 1887, with Queen Victoria obstinately insisting during preparations for her Golden Jubilee on wearing a bonnet rather than a crown for the celebratory parade. This is a central image for the story that follows, a handy synecdoche for the maneuverings of a woman acting as both grandmother and queen, welding the two roles together, drawing on her position as grandmother to execute her aims as queen and vice versa. Queen Victoria was a dedicated matchmaker, parachuting her children and grandchildren into various royal houses across Europe, littering the continent with descendants. Drawing materials in on the Royal Archives, including letters between Victoria and her children and grandchildren, Cadbury says the queen was pursuing a plan dreamed up by Prince Albert. He thought they could use strategic marriages to push Europe to a comparatively liberal future of constitutional monarchies modeled on the British system. And while the British throne was by this point increasingly a rubber stamp, there were still autocratic and semi-autocratic nations across the continent, meaning that their descendants had real power depending on where they ended up. Things didn’t always go according to plan, however. Queen Victoria didn’t want Alix of Hesse to marry the Romanov heir but she did it anyway, with disastrous consequences. (She wasn’t the only grandchild who ended up dead in the Russian Revolution, either.) Victoria managed to find a match—Princess Mary of Teck—for her grandson Eddy, who promptly died, and so she improvised, throwing him together with the next in line to the throne, George. Several of her grandchildren were crowned heads of state, but several of them lost their crowns, in the end. The Windsors today exist in a mass-media culture driven by celebrity, and a fair bit of their power is derived from leveraging their royalty to get attention for their philanthropic causes. Queen Victoria’s Matchmaking is a look at royalty when it still had a somewhat mystical aura—these people who were both the state and their own particular selves—and a fascinating angle on a time of ferment, when the wheels were finally, permanently coming off this way of running nations. All the while Victoria was trying to bend Europe to her husband’s vision, anarchists and revolutionaries are pushing for the end of monarchy altogether. And indeed, British royals haven’t really married other royals for nigh on a century—partly because there just aren’t that many European royals left, and there’s little geopolitical point to intermarriage. In some ways, the story is a real “Ozymandias” situation, a tale of grand aims that came to naught. And yet, you see echoes of the current Windsors, when the newspapers insist on seeing Mary and Eddy—and then Mary and George—as romantic love matches. Forget The Crown—what I really want is a Netflix show based on all these royal grandchildren. In the meantime, I spoke with Cadbury about royal marriages in Victoria’s day; our conversation has been edited for clarity and length. Queen Victoria and the next three in the line-up. From an account of Victoria’s Diamond Jubilee, publised 1899. Via the British Library’s Flickr account. JEZEBEL: Queen Victoria’s matchmaking was fairly legendary. But you make it clear that she was doing something more than garden-variety powerful grandmother meddling. What was her plan, and what was she hoping to achieve with this very systematic matchmaking of her children and grandchildren? DEBORAH CADBURY: I also had heard all the rumors of the meddling—that she’d induced one grandson to marry his dead brother’s fiance, and she thought nothing of breaking up engagements. But no one had ever looked at it in detail, as to what it said about her character. And one of the things that really struck me once I started to study the matchmaking was that there was an extraordinary vision behind this, that this had originally stemmed from Prince Albert, who was very earnest, studious, ambitious, and well-intentioned. After the Napoleonic Wars, in which up to 6 million people died, he really felt that there could be a new vision for Europe. They were Remainers before there was any idea of Remainers and Brexiteers. He had a vision for the dynasty, where the marital alliances of their children and their grandchildren might bring peace and stability. The idea was that through the marriages, it was a form of soft power, a way of spreading British liberal values across the continent. Perhaps even a pushback against the destabilizing influences of republicanism, revolution and war, because it was very turbulent times. The French revolution was still in living memory. And Albert gives the possibility almost of a federal Europe, where there were a series of strong, independent countries, stable under their own monarchies—modeled of course as closely as possible on the British system—but united by a common goals and interests. Eight out of their nine children were married into the royal houses of Europe. Then Queen Victoria’s got all these grandchildren growing up in all the grand houses and fabulous palaces of the Belle Epoque, the Gilded Age of the late 19th century, when royalty seemed to be at the very peak of its power. She had no less than 42 grandchildren growing up in these palaces. By the 1870s and ’80s, she’s in clover. She’s seriously interested in their marriages. And that’s the point at which I pick up the story. So why did they opt for this approach? Is that partly because the British monarchy is by this point in its history fairly limited in its formal power? What’s hard to imagine, if you go back in time to the mid 19th century, is just how much of Europe is under an autocracy—an authoritarian rule. And the British constitution was really the envy of so many people, countries. It seemed to point the way forward. Not seeing it TBH? Image taken from page 185 of ‘England in the nineteenth century. [Illustrated. ]’ Via the British Library’s Flickr. When Victoria and Albert started this policy, Germany was some 38 little duchies and princelings and city states, all under autocratic princely houses. So there were a myriad of little German princes that they could marry their children into, and five of them did marry German princes. But it became unified during the children’s generation and became the most powerful country in Europe, under one German emperor, who was really frankly semi-autocratic. Then in Russia, there’s three generations of Romanovs, and they are the world’s mightiest autocrats. The Russian empire covered a sixth of the surface of the globe, and the tsar’s word was law. If the tsar said you had to be sent to Siberia, or this divorce could or couldn’t happen—he was in charge of the judiciary, the punishment, everything. He appointed all his ministers. He had total control. You’ve also got the Austrian empire under a semi-autocratic leader. So the British constitution looked like the future. Revolutionary France, which was a republic, people had seen how bloodthirsty that revolution had been and they didn’t want a revolution like that in their countries. There was a real reason why this Albertine vision, if you like—they really believed would actually be for the good of Europe. Vicky, the oldest daughter, paves the way. She’s betrothed only at the age of 14 to a future German emperor. And Albert is absolutely clear to his beloved daughter Vicky that her marriage is not just about her happiness. It’s about the welfare of Europe. The future health and happiness of her people are at stake, and he’s totally relying on her to liberalize Germany. Something which, as I show in my book, she fails big time at. ﻿it was very turbulent times beneath this incredible facade of glamour and chandeliers and drinking wine and being swept around the ballroom in these fairy-tale lives. Who qualified as a potential spouse for Victoria’s children and grandchildren? Even in Prince Charles’s generation, they were basically out of princes and princesses. They weren’t marrying into the other royal houses of Europe because what was even left of them? But in Victoria’s time, what was the minimum viable title that any of these people could marry? Well, you see, at a time when these royal houses really were ruling vast swaths of land and a prince came with an empire in tow, a prince was one hell of a catch. Move over, Mr. Darcy. The heir to the British Empire, Prince Eddy for example, her oldest grandson—it seems hard for us to get our head round now, but the British Empire extended over a quarter of the globe. He was heir to this astonishing inheritance. So there was really very much a thing that royals married royals then. Certainly, if you were an heir to a throne or a second heir to a throne, you would not have been marrying a commoner. There was this whole set of rules about who should marry who and woe betide any princess who may have got a humble countess in her family tree, who was not a proper royal highness, who was just a serene highness, as indeed happened to Princess May, who actually broke all the rules and became the future Queen Mary. She was right at the bottom of the list of prospective brides for the British throne because of her morganatic blood, as it was called if the family tree wasn’t completely blue-blooded. But now, it would be bizarre if royals only had to marry royals. We look with pleasure when an heir to a throne marries a commoner. It’s something that is absolutely accepted. So how successful was she at her matchmaking? You mention that it really didn’t plan out very well for Vicky, for instance, her oldest daughter. But the matches that she attempted, did they take? How cooperative were all of these grandchildren? Well, that is really where I think the delight of the book comes. Because there’s a huge variety. I focused on the seven grandchildren who end up becoming heads of state, acceding to a throne, in the early years of the 20th century. In the build up to the Great War, to me it’s actually quite astonishing that so much power was concentrated in the hands of one family. And to that extent, you have to say that her policy had been very successful. You’ve got her favorite granddaughter Alix is the tsarina of Russia, and the tsar himself called her granny. The German emperor is also her oldest European grandson. That’s Kaiser Wilhelm, the disastrous kaiser that leads us into the First World War. And then in five other countries, too, you’ve got her grandchildren on the throne. A cameraman in front of the Queen Victoria Memorial, ready for Will and Kate’s 2011 wedding outside Buckingham Palace. Photo: Getty. But in real terms, it’s almost heartbreaking to see how the whole policy backfires, how the whole thing unravels, both from within and without. Coming back to Kaiser Wilhelm, from a very early age, Vicky has gone off to marry the future German emperor, Frederick. And they have this son, Wilhelm, and from a very early age, there’s this fantastic correspondence between Vicky in Germany and her mother in Britain. It’s so illuminating because Vicky is utterly frank with her mother, and from the very beginning, she thinks there’s something the matter with Wilhelm. She is struck by his aggression and struck by the degree to which he sets out deliberately to oppose her. Queen Victoria is saying to start with, look, just be very careful how you’ll handle him and I’m sure he’ll grow out of it. But it becomes absolutely clear by the teenage years—here he is, the shining hope for what a German-British alliance could achieve, and he is embodying the exact opposite traits to the ones that were wanted. He wants to promote his own personal rule, he’s passionately anti-English, he accuses his English mother of being a spy, he is aggressive, militaristic. And what amazes me, especially when you look at Trump tweets today, he is using the press—and the national press was a new thing then. All his speeches are aggressive and warmongering in stance, and it was whipping up the fury in the nations and making countries seek power alliances. The effect of this rhetoric was really to put Britain on a war footing. I’ve put it very simply, but you know, the German emperor being such a megalomaniac character, passionate about German greatness and how he was going to make Germany great again and get Germany its place in the sun at a time when it just couldn’t be accommodated within Europe, it was having such a horrible effect. And it’s also unravelling from without, because you’ve got so much power concentrated at the very pinnacle of society in the royal families. Poor people, working people, people moving to the industrial cities have got a really rotten deal. Their lives are short, their work is brutish, there isn’t enough food to put on the table, they’re not paid properly, there’s no trade unions. At is a time of absolute ferment. This is the late 19th century, the time that Marxist ideas are born, anarchist ideas are born, nihilism, you name it. You felt the sense that revolution was in the air. Indeed, in Russia, you get to the first revolution in 1905, and then again later. What also struck me—it punctuates these incredibly glamorous stories unfolding in the palaces—there’s such a marked contrast with the anarchists. There are so many violent assassinations at this time, particularly targeted towards royalty, starting with the assassination of Tsar Alexander II in 1881. And it’s a truly brutal murder. What amazed me, I was in the Royal Archives, and they’ve got this file on the assassination, and it turned out that telegrams were reaching Queen Victoria on the very same day. It was almost like email or Twitter today. No one knew at first the full measure of just what had happened. They thought they could save him. But as it gradually became clear, he was utterly destroyed by what was the first dynamite assassination, a bomb thrown into his carriage. Dynamite was a relatively new thing, and it was an impersonal, bomb-throwing kind of terrorism. And it was done deliberately. It was made a brutal murder because the anarchists believed in what they called “propaganda of the deed.” The idea was that they would inspire others by their actions. This inspiring murder would inspire others to rebel against the tsar. So it was very turbulent times beneath this incredible facade of glamour and chandeliers and drinking wine and being swept around the ballroom in these fairy-tale lives. I think the thing that most surprised me was you always hear about Alexandra being her granddaughter and the hemophilia and how Victoria married all these people off, etc. But I hadn’t realized that Victoria fought the marriage for years and did everything she could to prevent it. And it was for this exact reason—she thought Russia was too unstable. And in the long run she was right. She was exactly right. There is no doubt about it, if you’re a 19th century princess looking for a husband, listen to Granny. Because she was completely right when it came to Russia. It was almost as if she had these creeping premonitions. The warnings come through with such power and such obsessive repetition and it broke my heart, really, to see. Because what’s lovely about this is there are very strong women characters in this story, and I was delighted to see the characters who would stand up to Queen Victoria, because she’s a force to be reckoned with. Boy oh boy, some of these granddaughters could really stand up to Queen Victoria. It’s so poignant to see Ella, the tsarina’s older sister, and she knows perfectly well that Queen Victoria doesn’t want her to marry the Russian Grand Duke that she loves, and Queen Victoria has written in no uncertain terms—and she’s already broken off the engagement once—if you insist on this marriage, it will be your ruin. And of course we all know now she was absolutely right. And Ella writes back, and this was such a heart-stopping moment when I came across it in the archives, something like, if I am unhappy, and I know I never will be, it will all be my own doing. And she takes the train and it is just decked with highly scented bridal flowers and she’s taken in this Romanov faberge grandeur to the Peterhof and the Winter Palace and for the first few years, it looks like Ella has made an absolutely brilliant marriage. Queen Victoria and the Tsar and Tsarina. From an account of Victoria’s Diamond Jubilee, published 1899. Via the British Library’s Flickr. But the impact of all of this on young Alix, who’s coming along after Ella and rapidly blossoming into a beauty, that was for me a revelation, too. Until I was in the Royal Archives, I had not come across anywhere all that material that showed the love story between Alix and the tsarevich Nicholas, before Alix gets to Russia. I thought it was absolutely compelling, and so revealing of Alix’s character. We see an absolute kernel of everything that characterized her disastrous period where she was in power in the First World War. You see the obstinacy, the stubbornness, the magical thinking, the neuroticism, all of that is there right in the beginning. And it’s interesting that she, too, could not be less Albert’s grandchild. She is not acting as Albert’s grandchildren were meant to behave, with their eye on liberal values and fairness and decency. She became an autocrat herself. One gets the impression that Victoria and Albert rebrand the royal family and embrace these almost stereotypical Victorian middle class sensibilities about family. They’ll have these big weddings and all the cousins come and they hang out, except the cousins are people who become King George and Tsar Nicholas. Do the family dynamics end up mattering? Clearly that was part of the Albertine vision—we can work things out as a family to create a more stable Europe. How did it actually play out? You’re absolutely right, and it’s hard for us to fully get our heads around what it was like when the “royal mob,” as she called her family because it was huge, all got together in the late 19th century. Indeed it must have been astonishing, because, you know, there’s your uncle or your aunt and they’re King and Queen of Denmark, King and Queen of Germany, Russia, the heirs to the throne of Norway, Greece, it must have just been really astonishing to have so many heads of state all turning up with their suites. Hard work, too, if you imagine what was going on behind the scenes to make this all work. The one that gets most commented on is obviously the effect of Wilhelm, the oldest german grandson, in all these meetings. Because there came a point where Vicky could not paper over the cracks and his difficult and anti-English behavior was on display for the whole family to see and to react against. Similarly you can see it having an effect on the future tsarina, Alexandra, because she obviously was overawed at these family gatherings, and I was surprised to see from a young age how she’s excusing herself and asking her Granny not to invite her to this wedding or that wedding because it’s just too much for her. She obviously really did feel the pressure of having to be somebody and seem like the outgoing charming princess in this very elevated and important company as it then was. Although now we would not regard it as such. But then they were really the celebrities of their day. In the same way that we would pin up pop stars on our wall, they collected portraits of the royals. They were absolutely famous, these people. Crown Princess Victoria of Sweden, descended from Queen Victoria via her third son, Prince Arthur. It took me, like, an hour to figure this out. Photo: Getty. Queen Victoria was maybe one of the most flamboyantly, publicly in love married women of all time. There’s this statue in the National Portrait Gallery—you turn a corner and it’s them in faux medieval Saxon garb, embracing. Well actually I question that! What’s really interesting, if you look at the records, is there’s no doubt that she was incredibly strongly attracted to Albert. She thought he was a god, he was so physically attractive to her when they first got together, and she was very in love with him, probably more in love with him than he was with her. He was much more in love with what the position offered him. He was coming from a minor German state, before Germany was unified, and he was going to take up this first position in Britain and really have a chance to use his position to achieve something. He had ambitions, he wanted to do some good. But actually it was incredibly stormy. It perhaps doesn’t come across in the series, the degree to which she held onto her power even through her pregnancies, and the degree to which he wanted more power and recognition. And sometimes I look at those very statues you’re talking about and the fabulous pictures and you think, ah, when he died so young, did she have all the pain that went with feeling that it actually hadn’t been quite right? Almost like imagining and romanticizing something better than it was until, in the end, she’d put it on such a pedestal that what we see is what looks like a great love story. Indeed it was a love story—I don’t want to take that away from them. But it’s just that it was also incredibly angry and doors slamming and not speaking to each other and furious bouts of temper. And him in despair with her. I think that afterwards she almost idealized it, because she realized how much she depended on him and indeed did love him. ﻿There is no doubt about it, if you’re a 19th century princess looking for a husband, listen to Granny. I can’t help thinking that happiness came second. If it was a good match, then that counted for an awful lot. But it’s amazing how easily influenced the children were. If we go back to Vicky again at 14, falling in love with the Prussian, future German heir Frederick. She knew perfectly well that her parents had long thought about this match, and they really felt it was important for Europe. And there wasn’t an awful lot of romance for poor little Vicky. They were at Balmoral, and Frederick plucked some white heather from the moor and went down on his knee and asked for her hand in marriage, but it was a fortnight’s romance. Although Vicky did love Frederick, it was very much complying with what her parents wanted. I think by the time we come to the grandchildren’s generation, by now Victoria’s had the problems with Wilhelm, and she’s having second thoughts about some of the grand foreign alliances, and she is being much more practical and instinctive and less guided by intellect. Albert, you know, everything was driven by an intellectual vision of how Europe can be and the family’s going to play their part, rather than by emotion. But Albert’s gone, and left to her own devices, she becomes much more instinctive and emotional and sometimes sentimental and more easily swayed. Sometimes more adaptable and sometimes really fierce. For instance, she gave her granddaughters no peace about Russia. She really didn’t want them to go to Russia. But in the end, when they made it clear they wanted to go, she did let them. Similarly with Eddy, the British heir, when he really pleaded with her that he was in love with this French princess, Helene, who had declared her love for him—somewhat calculatingly—but Eddy was taken in, and Queen Victoria was also absolutely swept along with it and did everything she could to make it happen. So I think you get a much more interesting and nuanced Queen Victoria in the later years, when she’s dealing with the grandchildren, and I enjoyed that. I thought that she was an interesting person to be studying and seeing how she was going to make her decisions. Still very much in control, but much more prepared to listen to what they’re saying. The royal family of Norway, also descended from Queen Victoria via her daughter, Maud. Photo via Getty Images. In the end, her matchmaking didn’t really pan out very well, did it? Yes, she did get the seven crowned heads, but three of them lost their titles. In the final analysis, how well did she do? I think we’d have to say that the matchmaking didn’t work. But sometimes for reasons that were well beyond their control. And also one of the great ironies was that it was started from the best of intentions. It really is one of these really Shakespearean tragedies. Best laid plans can still go awry. Now, I think the degree to which you blame the matchmaking for the great tragedy that unfolded in Europe at the beginning of the 20th century very much rests on how much you blame Wilhelm for starting the Great War. And that is beyond the scope of this interview. Historians have debated it for a century. As a last question: obviously everyone is very excited about the prospect of another royal wedding. But so much has changed in the last hundred years—are there even any commonalities anymore in the institution of royal marriage? Does it serve any of the purposes that it did in Victoria’s day? I think a great deal of the restrictions have just dropped away. Royalty marrying royalty. Royalty not marrying a divorcee. None of this applies anymore. I think in terms of it being a symbol for the whole of society, that we want to believe that there is a fairy tale and we want to believe that this is a great romance, I think royal marriages matter just as much as ever they did. We all want to really believe that Meghan and Harry, you know, this is it. They are in love. And to the extent that the royals play an appeal to that side of the public’s appetite for a really good romance and a love story and appear to have lives that are just lifted above the ordinary, that are touched with glamour and success and love, everyone wants to believe it’s true.